Open the Asset Calendars window. Enter the name of your Calendar. Choose Fiscal or Calendar to append either the fiscal or calendar year to get the accounting period name. If you do not want the fiscal or calendar year automatically appended, choose None. Enter the Fiscal Year Name you want to use for this calendar. Enter the number of periods in the fiscal year for this calendar. Enter the Name of this period. Enter the start and end dates of this period. Query the calendar for which you want to change period names and scroll to the last period. From the Main menu, select Edit/Delete Record. Delete all of the periods you plan to rename. Reenter the deleted periods with the correct name. section illustrates the relationships among Oracle Assets accounting reports. with the asset batch totals found in the Subledger Accounting Account Analysis report. 1. In Oracle General Ledger, match the ending balances in the Detail Trial Balance report with the ending balances in the ledger Subledger Accounting AccountAnalysis report. 2. Match the general ledger ending balances with those of the Cost Summary Report. 3. Match the ending balances of the Cost Summary Report with those of the Cost Detail Report. Match the individual source amounts of the Cost Detail Report to the detail reports in the next steps. 4. Match additions to cost in the Asset Additions report. 5. Match adjustments to net change in the Cost Adjustment Report. 6. Match retirements to cost retired in the Asset Retirements Report. 7. Match reclasses to cost in the Asset Reclassification Reconciliation Report. 8. Match transfers to cost in the Asset Transfer Reconciliation Report. 1. In Oracle General Ledger, match the ending balances in the Detail Trial Balance Report with the ending balances in the Subledger Accounting Account Analysis report..
2. Match the general ledger ending balances with those of the CIP Summary Report. 3. Match the ending balances of the CIP Summary Report with those of the CIP Detail Report. Match the individual source amounts of the CIP Detail Report to the detail reports in the next steps. 4. Match additions to CIP cost in the Asset Additions report. 5. Match adjustments to CIP net change in the Cost Adjustment Report. 6. Match retirements to CIP cost retired in the Asset Retirements Report. 7. Match capitalized to CIP cost in the CIP Capitalization Report. 8. 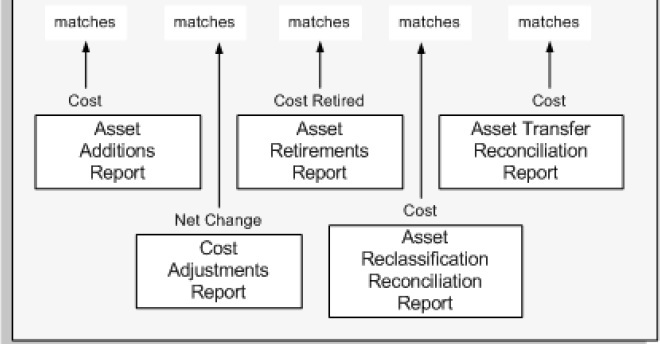 Match reclasses to CIP cost in the Asset Reclassification Reconciliation Report. 9. Match transfers to CIP cost in the Asset Transfer Reconciliation Report. 10. Match ending balances to CIP cost in the CIP Asset Report. 1. 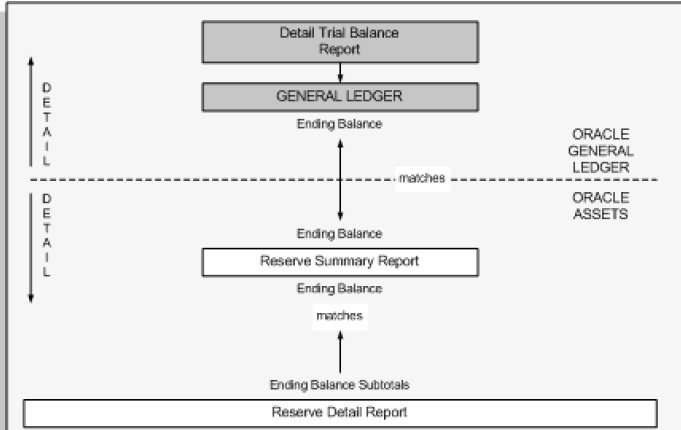 In Oracle General Ledger, match the ending balances in the Detail Trial BalanceReport with the ending balances in the Subledger Accounting Account Analysis Report. 2. Match the general ledger ending balances with those of the Reserve Summary Report. 3. Match the ending balances of the Reserve Summary Report with those of the Reserve Detail Report. Match the individual source amounts of the Reserve Detail Report to the detail reports in the next steps. 4. Match additions to accumulated depreciation in the Asset Additions report. 5. Match adjustments to reserve adjustment in the Reserve Adjustments Report. 6. Match retirements to cost retired and NBV retired in the Asset Retirements Report. 7. Match reclasses to accumulated depreciation in the Asset Reclassification Reconciliation Report. 8. Match depreciation to depreciation amounts in the Account Reconciliation Reserve Ledger report. 9. Match transfers to accumulated depreciation in the Asset Transfer Reconciliation Report. In Oracle General Ledger, use the Detail Trial Balance Report to match with the ending balances for the Subledger Accounting Account Analysis Report. Use the Journal Entry Reserve Ledger report to match the depreciation balances with the ending GL depreciation balances. 1. Match asset journal amounts found in your general ledger with those in the Cost Clearing Reconciliation Report Oracle Assets automatically makes these journal entries for your general ledger. 2. Match amounts in the Cost Clearing Reconciliation Report with those in the Mass Additions Posting Report. Adjusting journal entries are necessary for account transfers and cost adjustments to posted invoice lines. 3. Match amounts in Mass Additions Posting Report with those of the Mass Additions Invoice Merge Report, Mass Additions Invoice Split Report, Unposted Mass Additions Report and Mass Additions Delete Report. Oracle Assets posts mass additions with a status of post. You can also match amounts in the Mass Additions Posting Report with those in Additions by Source Report and Cost Adjustments By Source Report. The Asset Additions Report includes posted mass additions as well as manual asset additions. 4. Match amounts in the Mass Additions Invoice Merge Report, Mass Additions Invoice Split Report, Unposted Mass Additions Report and Mass Additions Delete Report with amounts in the Mass Additions Create Report. Split, merge, delete, place on hold, or prepare for posting invoice line items brought over from accounts payable. Use the Cost Clearing Reconciliation Report to match additions with those found in the Additions By Source Report. Use the Cost Clearing Reconciliation Report to match adjustments with those found in the Cost Adjustment By Source Report. 1. How often can you run Mass Additions Create during an open period? A: You can run Mass Additions Create as often as you like during an open period. You should run the create program regularly so that you do not have an excessive number of invoice distributions to review at one time. 2. What data is transferred when an invoice line becomes a mass addition line? Invoice Number - This defaults from the invoice header. Line Number - This defaults from the invoice distribution line number. Queue - All Mass Additions from AP come in on the NEW queue. Description - This corresponds to the invoice line distribution description. One mass addition line is created per invoice distribution. Units - If the invoice is not matched to a purchase order then mass addition lines will be created with a default of one unit. Cost - This will match the invoice line distribution amount. Category - This will ONLY be populated if the item on your invoice line is defined in Oracle Inventory with a default category. Normally this field is NULL. Supplier Name and Number - These default from the invoice header. PO Number - This will be populated if the invoice is matched to an Purchase Order. Source Batch - This will be populated if you entered a Batch Name when as a Parameter when running the Payables Transfer to GL. Project Number - This will contain the Project Number if the line came from Oracle Projects. Task Number - Oracle Projects field. Create Batch - This number represents the concurrent request id of the Create Mass Additions run that created the line. Create Date - This is the same as the invoice date. Source System - This is how we can tell where the line originated e.g. Oracle Payables. Invoice Date - This is populated from the invoice. Clearing Account - This will contain the invoice line distribution GL Account that would correspond to an existing Asset Categories Clearing Account segment. Asset Type - This is defaulted from the asset category - e.g Capitalized if the invoice line matched an Asset Clearing Account and Expensed if the invoice line was an expensed item that was tracked as an asset. Book - This is defaulted from the book that Mass Additions Create was run. Depreciate - This is automatically checked if the asset type is capitalized and not checked if the mass addition line is of type Expensed. Date in Service - This depends on the sysdate. 3. Mass Addition Lines have been created but the log file shows a warning about the number of units being invalid. What does this mean? Invoice ID: 119788 Distribution Line Number: 10 Warning! Cause: The invoice line from which you created a mass addition has units greater than the limit of 9999, null units or fractional units. When an invoice line is not matched to a Purchase Order, the units associated with the invoice line are NULL. In Oracle Assets, the units column is required to permit the assignment of depreciation expense account distributions. Therefore a default value of 1 is assigned to these lines. 4. How is the DPIS for the mass addition line determined? A: You may expect that the date placed in service should be the invoice date, however this is not true. If the sysdate is in the current open period, the default date placed in service is the calendar date you enter the asset. If the calendar date is before the current open period, the default date is the first day of the open period. If the calendar date is after the current open period, the default date is the last day of the open period. You have the choice of accepting this date or entering any other date in the current accounting period or any prioir period. You can never add assets with a future DPIS. You can change the DPIS at any time. If you change it after depreciation has been run, Oracle Assets treats this as a financial adjustment and the depreciation reserve is recalculated accordingly. 5. What is the 'Track As Asset' flag for on the invoice line? A: If you enter an Asset account on the invoice line, then the track as asset flag will automatically be checked. However only Asset accounts that are setup as asset clearing accounts are accepted by the Mass Additions Create Program. If you want to send expensed lines over to Assets i.e. lines that will become expensed assets and not depreciate then you can manually check the Track as Asset box and these will be picked up by the Mass Additions Create program as Expensed lines. 6. Can I create Mass Addition lines from invoices in AP that were submitted for approval but placed on hold? A: Invoice lines with certain types of holds can still be sent to Oracle Assets. For details on the different types of holds please review Appendix E in the Oracle Payables User Guide. 7. How To Run Mass Additions Again In AP For Data Already Flagged For FA? 8. Mass Additions Create created duplicate lines. How did this happen? A: The problem could be the fact that several Mass Additions Create Programs were submitted in parallel and the Concurrent Program Definition for the executable APMACR is not incompatible with itself. Login to System Administration responsibility and set the program to be incompatible with itself under concurrent>program>define. Auto Install does not set the incompatibility of this program. 9. How is the PO information transferred to FA? A: If you created an invoice based on a PO then FA will take this information from AP. 1. What is unplanned depreciation? Answer: Unplanned depreciation is a feature used primarily to comply with special depreciation accounting rules in Germany and the Nederlands. However, you also can use this feature to handle unusual accounting situations in which you need to adjust the net book value and accumulated depreciation amounts for an asset without affecting its cost. Oracle Assets immediately updates the YTD and LTD depreciation and the net book value of the asset. The unplanned depreciation expense you enter must not exceed the current net book value (Cost - salvage value - accumulated depreciation) of the asset. 2. Can depreciation be suspended for a specified period of time? Answer: Depreciation can be suspended at any time by changing the depreciate flag on the book form to No. Note that the total depreciation to be taken over the life of the asset (including that incurred in periods the flag was set to No) will still be taken over the original life assigned to the asset. If the asset was added with the depreciate flag set to No, missed depreciation will be caught up in the period the flag is changed to Yes. If the asset was added with the depreciate flag set to Yes and the flag was later changed to No, the missed depreciation will be caught up in the last period of the assets ORIGINAL life; suspending depreciation will not extend the period over which the asset is depreciated. 3. Can depreciation expense be manually input to override the system? Answer: Depreciation reserve adjustments can be made to a tax book. From release 10.7, with unplanned depreciation you may manually override the depreciation amount taken in the corporate book. The depreciation amount cannot be greater than the net book value of the account. 4. How does the 'Depreciate When Placed In Service' flag on my prorate convention affect the calculation and allocation of depreciation? Answer: With the exception of the method type 'Calculated Straight Line', depreciation for the year is calculated based on the prorate date which maps to a prorate period and rate on the prorate calendar. This total amount is then allocated back to the individual periods in the year. If this flag is set to 'No', the years depreciation will be spread over the periods beginning with the prorate date. If the flag is set to 'Yes' , the years depreciation will be spread over the periods beginning with the date placed in service. Note that total depreciation for the year remains unchanged, only depreciation per period will differ. When the method type calculated straight line is used, this flag has no effect. Yearly depreciation will be calculated as recoverable cost/life, and allocated beginning with the prorate date. 5. GAAP defines two types of changes; changes in estimates which are to be handled prospectively and errors which are to be retroactively corrected. What Oracle functionality addresses these? Answer: Expense an adjustment for correction of an error, amortize the adjustment for a change in estimate. 6. How do I set up Oracle Assets to charge a half month's depreciation in the first and last periods of the assets life? 1. Set up a prorate CALENDAR with semi-monthly periods. So your prorate calendar will have 24 periods per fiscal year. 2. Set up a prorate CONVENTION that maps the appropriate dates to the middle of the month. 4. Set the default prorate convention to the appropriate mid month convention in the Default Depreciation Rules zone of the Asset Categories form. You can also specify the prorate convention in the Books window during the detail additions process. Now when the depreciation program processes an asset whose date placed in service is Jan 10, it will use the prorate convention to map that date to a PRORATE DATE of Jan 16, and it will use the prorate date to map to PRORATE PERIOD #2 in your prorate calendar. Thus, if you are running depreciation for January (note that your DEPRECIATION CALENDAR can still be monthly), you will get half a month's worth of depreciation for January. Answer: Using'What If Analysis, you can model depreciation scenarios for any number of future periods based on depreciation attributes different from what you have currently set up for the asset. Hence the name: 'What If Analysis'. Using 'Depreciation Projection', you can project depreciation expense based on the asset's current depreciation method, life, etc. Additionally, 'What-If Analysis' is very flexible in allowing you to select a subset of assets for analysis. Selection criteria include Range of Asset Numbers, Range of Dates Placed in Service, Asset Category etc. For 'Depreciation Projections', you must specify a BOOK and the program selects all active assets for that book. "Error: function fafbgcc returned failure (called from fadoflx) Getting account CCID" How do I correct this problem? Find out which category the asset belongs to. (using Asset workbench). Clearing Account or (CIP Cost Acct/CIP Clearing Account if the asset is CIP). Find out the default CCID for the book from Books Screen. Find out the distribution CCID (only if it is prior period addition). 9. What depreciation methods are supported within Oracle Assets? 10. When should I run the depreciation program? Answer: In release 11i you can run depreciation any number of time but without checking the close period checkbox.In release 11 You should run depreciation when you are ready to close your depreciation period. In release 11i depreciation can be roll backed as many number of time untill close period check box is checked. In release 11,Depreciation CANNOT be rolled back once run. Since the depreciation program closes the period, you should make sure that you entered all your transactions for the current period. If you forget to enter a transaction in the current period, you can enter a retroactive addition, transfer, or retirement transaction in the following period. Oracle Assets will not calculate adjustments to depreciation until you run depreciation again. If you are closing the last period for a fiscal year, you cannot enter a retroactive retirement for a period after the end of the year. 11. How often can I run depreciation? Answer: In release 11i you can run deprecaition any number of times untill you run depreciation with close period checkbox checked. While in release 11 You can run depreciation only once per depreciation period. When you run depreciation and close the period, you CANNOT reopen that period. You must run depreciation for EACH corporate and tax book; Oracle Assets does not run depreciation automatically for a tax book when you run depreciation for the associated corporate book. Run Mass Copy to update your tax book prior to running depreciation for the tax book. 12. What happens if I run depreciation when there are retirements or reinstatements pending? Answer: When you submit depreciation, the process automatically runs the gain/loss program to calculate gains and losses for any pending retirements. You also can run the gain/loss program independently in order to reduce depreciation processing time. 13. What is the difference between depreciation projections and depreciation? Answer: Depreciation projections use a completely separate set of modules than the Depreciation program uses. Depreciation projections do not take into account adjustments entered in the current period, so any new retirements, transfers, or adjustments are not taken into account. Projections simply take a snapshot of the asset at the start date of the projection and project depreciation expense based on that information. 14. What happens if depreciation encounters an error? How do I proceed? Answer: If the depreciation program encounters an error, the program will stop and perform a rollback to the previous commit. The program automatically resets the DEPRN_RUNNING_FLAG to NO. If the error is straightforward, such as "Out of rollback segments", you can try to correct the error and then resubmit the depreciation program. If the error is more serious, such as an operating system error, you should call Support before taking any further actions. 15. What can I do to reduce processing time for the depreciation program? Run gain/loss at several times throughout the period (you can run the gain/loss program as often as you want). Then, when you finally run depreciation, the gain/loss program will process only a few retirements or reinstatements instead of many. Ensure that your tables are not fragmented. Ask your database administrator to check for fragmentation problems. If fragmentation exists, export and reimport the tables,or recreate them. 16. How does the depreciation program handle the end of a fiscal year? Answer: At the end of a fiscal year, the depreciation program runs a short module to prepare Oracle Assets for the next fiscal year. This module runs automatically during the depreciation program. The fiscal years program runs if the current period is the last period in the fiscal year. This occurs when the period number of the current period = NUMBER_PER_FISCAL_YEAR in the table FA_CALENDAR_TYPES. The fiscal years program checks if there are rows defined for the next fiscal year in FA_DEPRN_PERIODS, FA_FISCAL_YEAR, FA_CALENDAR_PERIODS, and FA_CONVENTIONS. If rows do not already exist, the fiscal years program creates them. 1. Is it possible to perform mass retirements? Yes. You can use the Mass Retirements window to retire a grouping of assets. Please refer to the Oracle Asset User Guide for details. 2. What is the earliest retirement date I can enter for a prior period retirement? of the last transaction for the asset in this book. only lets you reinstate the most recent retirement you entered. 4. What journal entries does Oracle Assets create for a retirement? depreciation reserve. This is effective in the current accounting period. 5. What journal entries does Oracle Assets create for a reinstatement? retired the asset and to recover depreciation not charged to the asset. deletes the retirement transaction and does not create any journal entries. 6. What is a retirement convention? 7. Can I retire expensed items? the asset in all the associated TAX books? manually enter a retroactive retirement in a later period. 9. What reports can be run for retirement information? 10. How can I retire an asset that was added in the current period? You must enter it as a prior period retirement after you run depreciation. affecting any subcomponents and no journal entries will be created. Please note you cannot backdate a retirement to a previous fiscal year. 11. Can I retire CIP assets? 1.How To Transfer The Journals To GL That Have Already Previously Been Accounted By Create Accounting? Create Accounting does have the option to transfer to GL for the user's convenience to allow both in a one-step process. If Create Accounting was run successfully with this parameter set to No, the records will not be picked up again when Create Accounting is run again.Instead, one needs to run program Transfer Journal Entries to GL - Assets to transfer any accounting that is created in Final mode, but not transferred. Navigate: Fixed Assets Responsibility > Other > Requests > Run > Select and Submit the Transfer Journal Entries to GL - Assets program (FAGLTRN) with parameters to include the journal entries to be transferred. If the program does not exist for the Assets request group you are using, you should be able to add it to your request group for FA. - Add the program Transfer Journal Entries to GL - Assets to the list from the LOV. Now you can run the program Transfer Journal Entries to GL - Assets. 2.How Is Depreciation Catchup Charged In Period Of Addition sent To GL In Release 12? When an asset is added as Expensed with backdated Date Placed in Service ,the application calculates depreciation catchup in the period of addition. In Release 11i, this depreciation catchup is part of the Depreciation Journal which is created after running Depreciation. For example, an asset is added in period SEP-08 as Expensed with cost =1000 and Prorate date= 01-JAN-2008 . In Release 12 , with the SLA model , behavior has been changed : the expense is allocated to the event that drove it. 3.Can the Payables Code Combination Identifier (PAYABLES_CCID) be used as a source for accounts other then the Asset Clearing account? No, it cannot be used as a source for any other account then the clearing account as the PAYABLES_CCID is not loaded for e.g. the Cost account. It is only loaded for the Clearing account. Validate Application Accounting Definitions and Create Accounting will not fail, it will just simply not load and use it. It would also be problematic as e.g. what would happen if a second invoice with a different Clearing Account from AP would be added or if a source line transfer would be performed or a retirement? The system could only use one CCID. 2. Set up a descriptive flexfield to contain that value set and enter the segment value there when creating the asset. 4.How to setup the secondary ledger so that the results of the corporate FA book journals to be generated for the secondary ledger also? b. Query for your ledger. c. Press Update button for your Secondary Ledger. d. In the ledgers form, press Update button for Subledger Accounting Options of your secondary ledger. e. For Assets application press Update Accounting Options button. f. Ensure that Subledger Acounting Enabled and Use Primary Ledger Amounts options are set to Yes. If they are not set to Yes then please set them and press Apply button. Detail level. You should be able to see now in the Create Accounting output the secondary ledger journals associated with the corporate book. 5.R12: How To Transfer Reconciliation References From FA Subledger To GL? b. Give your Journal Line Type code, name, and description a meaningful name. f. Link the Journal Line Type just created to the Journal Line Definition. Copy a seeded one and create your own if needed. g. Assuming that the JLD is already linked to the Application Accounting Definition, validate the Application Accounting Definition either in the form or via the concurrent program 'Validate Application Accounting Definitions'. Assuming also that the Application Accounting Definition is already linked to the Subledger Accounting Method which in turn is already linked with the ledger, Create Accounting can now be run. h. Once Create Accounting, Journal Import and the Post program in GL have completed, one can reconcile either manually or run Automatic reconciliation in GL. 6.How to avoid the transfer to GL of the journal entries related to the tax book in R12 ? This is the intended functionality to create the accounting entries in SLA for both the corporate book and the tax book as it is required for reporting. However, the accounting entries for the tax book can be prevented from being transferred to GL by keeping the check box 'Allow GL Posting' unchecked for the tax book in the Book Controls screen. 7.The CODE_COMBINATION_ID column in the FA_ADJUSTMENTS table contains NULL values in Oracle Applications Release 12 Why ? This is one of the main changes related to Subledger Accounting (SLA) in R12. The account combination is generated during the Create Accounting process and it is stored in the SLA tables. 8.How to Show The Error Messages In The Create Accounting For Assets Program If It Completes With Warning ? Really a wonderful post . Very useful.